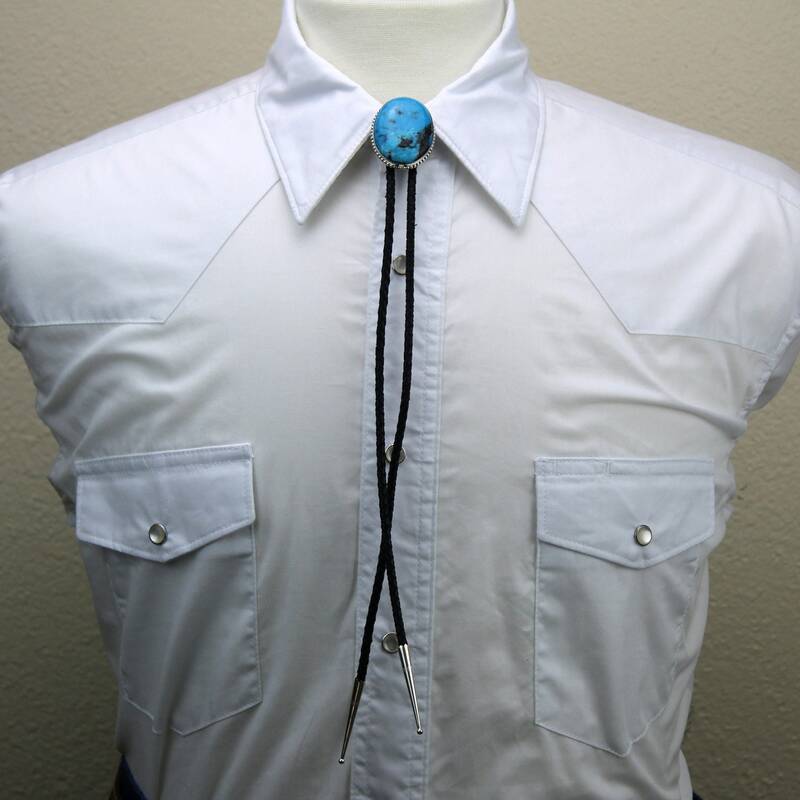 Western Bolo Tie - Turquoise Bolo Tie - Cowboy Bolo Tie - Silver Bolo Tie: This impressive sterling silver western bolo tie features a Kingman Turquoise stone. The Turquoise stone is 40mm x 30mm (1 1/2" x 1 1/4"). The setting is 42mm x 32mm (1 5/8" x 11/4") and has a tension clasp that is attached with two rivets for extra strength. The stainless steel tension clasp is easier on the cord, and easier for the user! The black leather cord is 38" long. 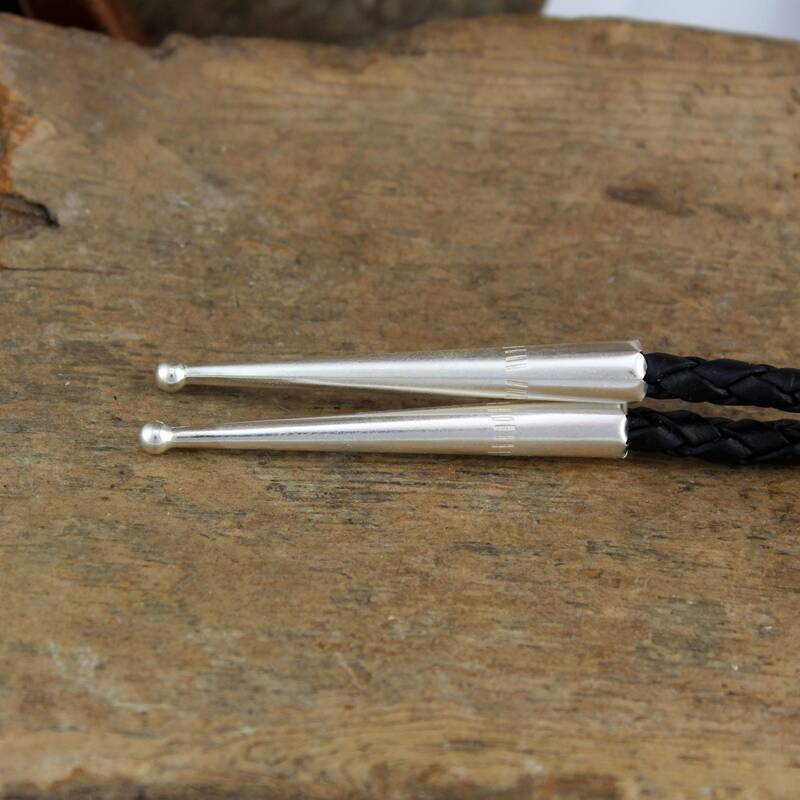 It has sterling silver tips with 3mm bead ends. The tips are 44mm (1 3/4") long. If you don't like the cord or tips, don't worry, they can be switched to something more to your liking upon request! The cord can also be lengthened or shortened to suit your needs! The Turquoise rough was mined near Kingman Arizona and has been stabilized. 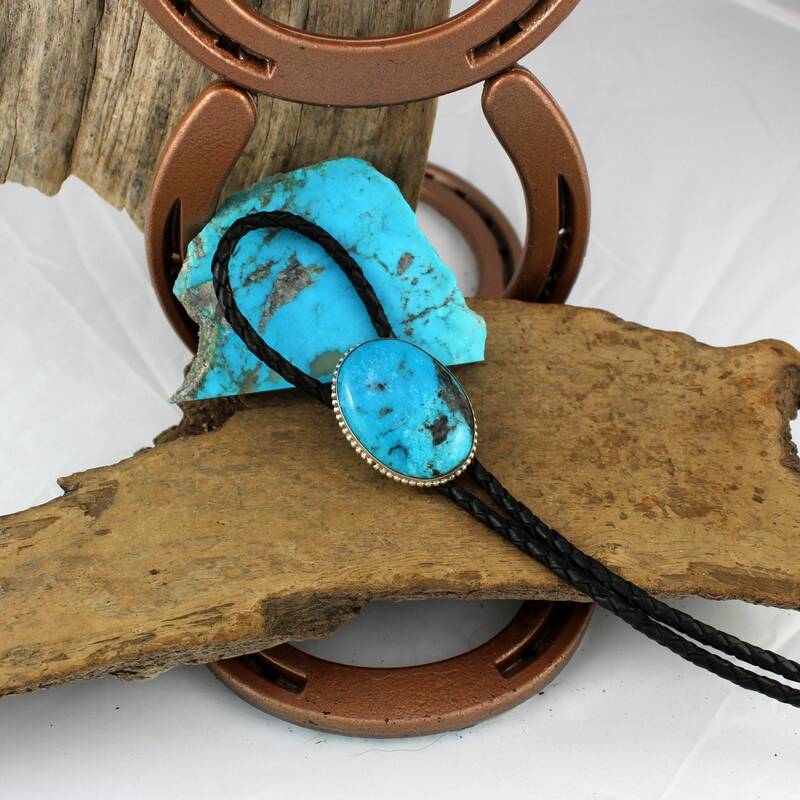 Stabilized turquoise is natural turquoise that has been treated to stabilize the color and the stone. 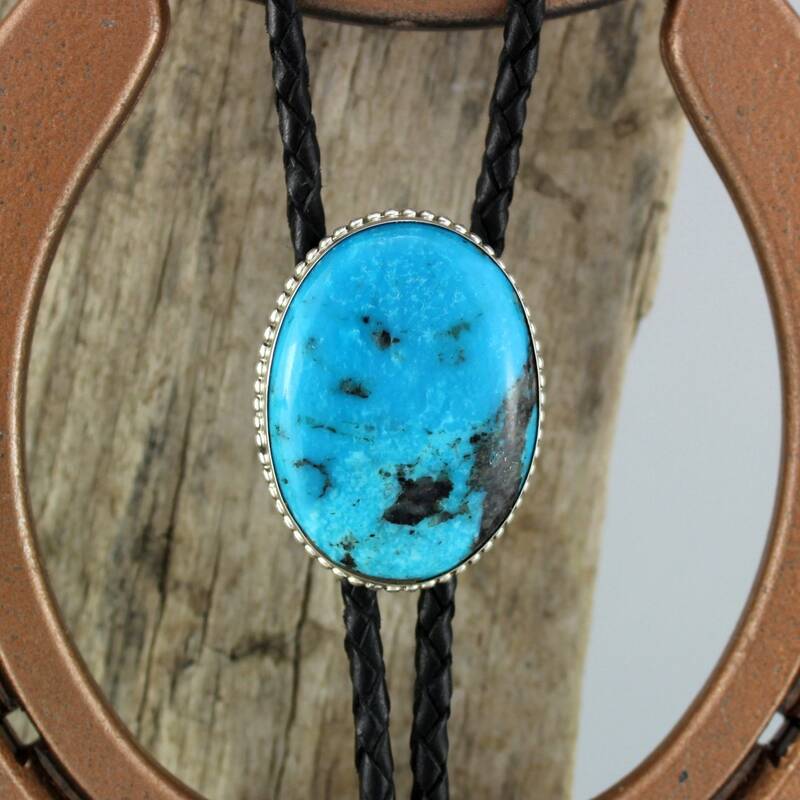 It is genuine turquoise and not dyed! 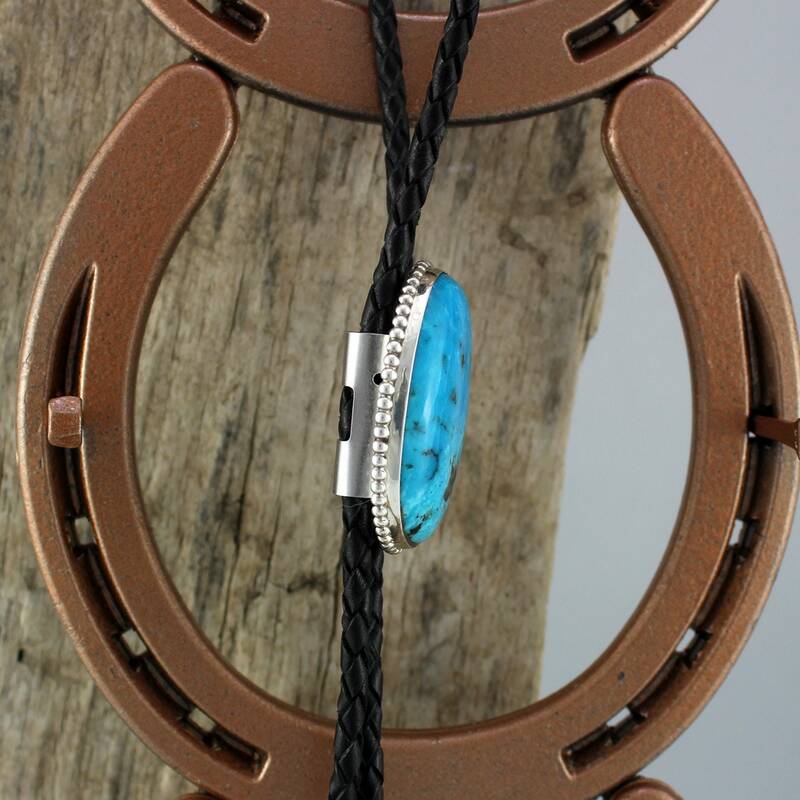 This piece of Kingman Turquoise was shaped and polished in our work shop in Montana and it gorgeous! This stone has a fantastic blue color! 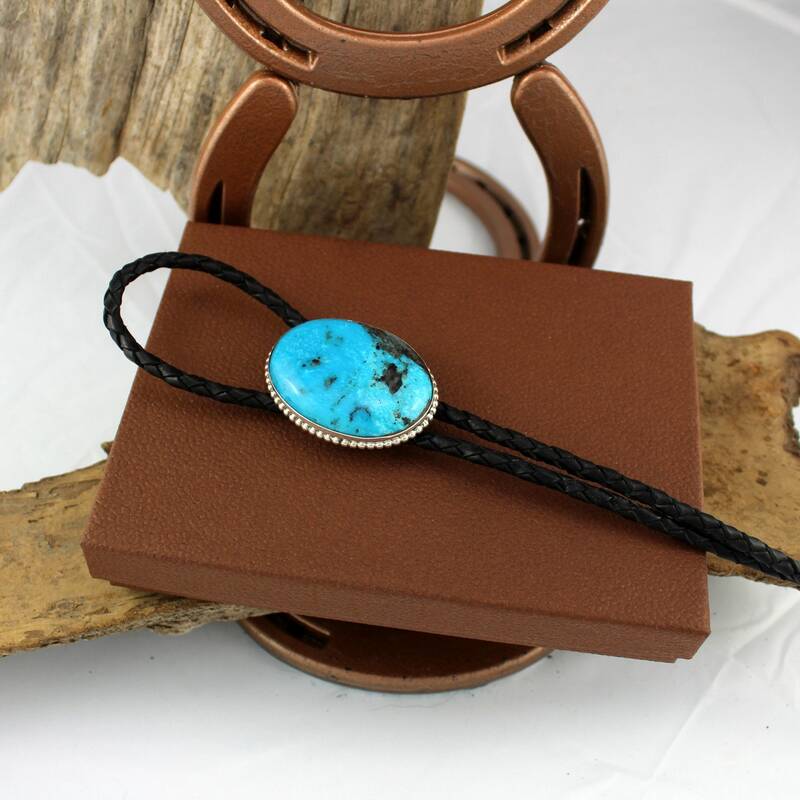 It is a great example of why Turquoise has been mined in this area for over 1000 years! We also made the new sterling silver slide with a bead-edge. We left it a little "rough" around the edges to give it a slightly "handmade vintage" look! 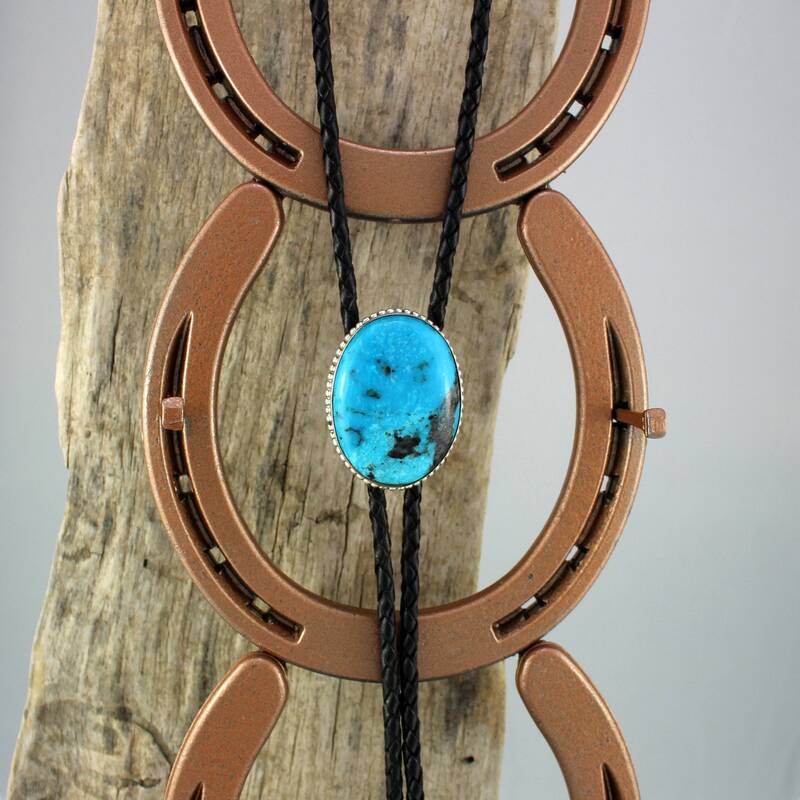 This is a great looking western bolo tie that can be worn by either men or women. 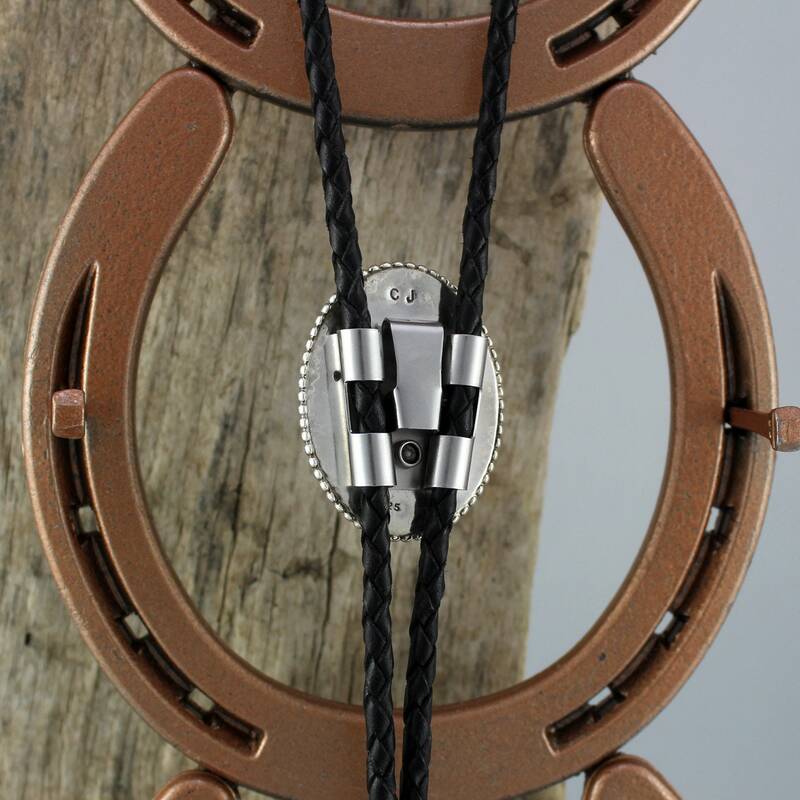 You can wear it loose for an informal look or cinch it up tight for a more traditional western style. 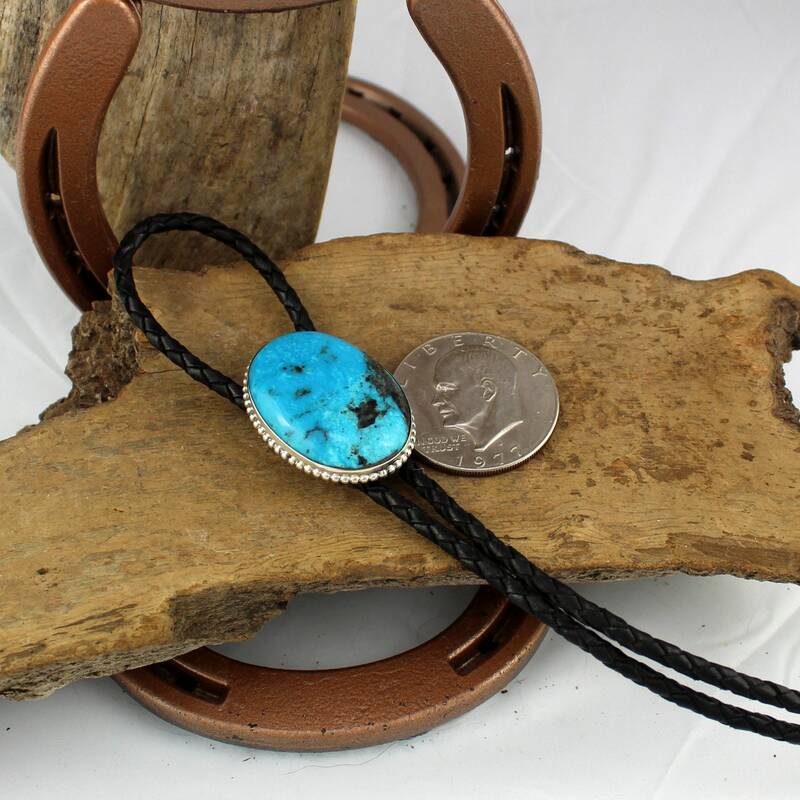 This one of a kind bolo tie will add that perfect touch of class for an affordable price! 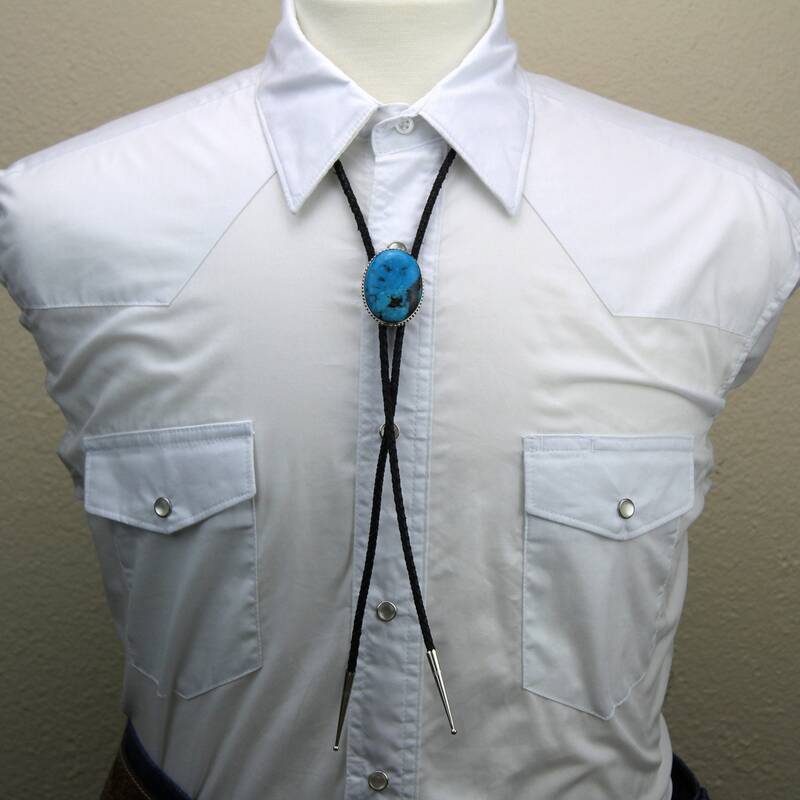 As with all our bolo ties, we will ship this tie in a beautiful gift box for no extra charge!